A raft of economists have called for a road-user charge, including former Treasury Secretary, Ken Henry, in his tax review, and former Productivity Chair, Peter Harris. The Morrison government has shelved a long-promised inquiry into taxing motorists based on when and how far they drive, ducking a fight over the politically fraught issue in the run-up to the next federal election. Transport groups have lashed the decision not to proceed with an inquiry into road-user charging, which was intended in part to address a looming budgetary crisis from shrinking fuel excise revenue caused by improved fuel efficiency and the take-up of electric cars. Former major projects minister Paul Fletcher promised in November 2016 the government would examine options for slugging motorists for each kilometre they drive. Despite repeatedly saying an eminent person would soon be appointed, the inquiry never got off the ground, with responsibility falling to Deputy Prime Minister and Transport Minister Michael McCormack following the change of prime ministers in August. Mr McCormack’s office declined to give a commitment to holding the inquiry when AFR Weekend asked if it was still going ahead. “Looking at ways to reform the way roads are funded and paid for is complex and requires all levels of government working together. The issues to be examined are long term in nature and will take significant work to fully explore and be considered,” a spokesman said. Mr McCormack’s office said the logical first step for road-user charging was the heavy vehicle sector. Work was under way to examine current charging arrangements and future options, including how heavy vehicles pay to use road infrastructure. “Road-user charging for light vehicles, should governments wish to pursue wider reform of the way we pay for our roads, is likely to be a 10-15-year prospect,” the spokesman said. AFR Weekend understands the government had gone as far as to identify former NSW minister and NRMA president Wendy Machin, former Victorian transport minister Peter Batchelor and former Infrastructure Australia chief Philip Davies to head the inquiry. The government expects to collect $19.6 billion in excise on petrol, diesel and other fuels. Motorists now pay 41.2¢ a litre in excise, amid warnings the price at the bowser could nudge past $2 a litre. The Parliamentary Budget Office found in July that fuel excise’s share of gross domestic product had fallen from 1.6 per cent in 2001 to 1 per cent in 2016-17. Even with the reintroduction of twice-yearly indexation in 2014, excise kept falling thanks to ongoing improvements in fuel efficiency, a trend that will continue and be exacerbated by the growing sales of electric cars. 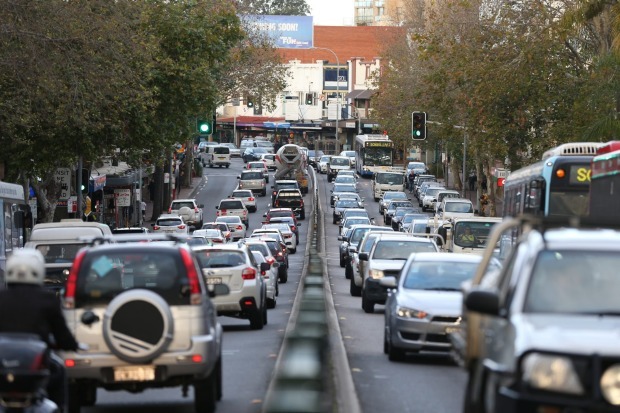 The erosion of fuel excise has called into question governments’ ability to build and maintain roads in the future, while road-user charging advocates also argue it can be used to reduce congestion, with motorists paying more to drive during peak hour. A raft of economists have called for a road-user charge, including former Treasury secretary Ken Henry in his tax review and former Productivity Commission chair Peter Harris. The Australian Automobile Association, the peak lobby group for motorists, said while recognising road-user charging was a challenging policy issue, the stalemate was disappointing. “The various political sensitivities don’t dilute the economic importance of the required reforms,” chief executive Michael Bradley said. “Our tax system contains a well-understood structural flaw that not only increases inequity, it is increasingly inhibiting our ability to address the safety and congestion problems that already cost our economy $50 billion per year. Infrastructure Partnerships Australia chief executive Adrian Dwyer said the inquiry would lead to a better and fairer way to pay for roads. “This issue isn’t going away. With more fuel efficient and electric vehicles on the roads, fuel excise revenue is in rapid and terminal decline,” he said. Mr Dwyer said irrespective of whether the inquiry went ahead, the government should impose a per-kilometre charge on electric vehicles. “This is politically possible while there is only 8300 electric vehicles on the roads, but the opportunity diminishes every day a new electric vehicle drives out of the dealership,” he said. Opposition transport spokesman Anthony Albanese said the uncertainty over the inquiry was symptomatic of a government that had stopped governing. “They announced this two years ago, there has been many speeches about it, much expectation raised and they’ve not even managed to form a committee,” he said.